Vintage From Paul is delighted to offer these classic Wood & Sons Enoch Wellesley Ironstone Dinner Plates. 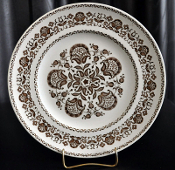 The Wood & Sons Enoch Wellesley Ironstone Dinner Plates have a creamy white ironstone body accented with a deep brown floral and scroll design. The Dinner Plates measure a generous 10-1/2 inches in diameter. Each of the available Dinner Plates is in mint condition. There are no defects or flaws noted. The colors are vibrant, the graphics crisp. The Dinner Plates are hallmarked in black with; Wellesley by Wood & Sons, Oven Detergent & Dishwasher Proof, Burslem England Master Potters Since 1750".